Last year we showed you how to use Gogoprint's calendar template and what tools you might need for that. This time we focus on the creative side of calendar design. As you may have guessed, a calendar is a very discreet way of putting a brand in front of its target audience. However, considering the number of promotional materials people are bombarded with on a daily basis, it would be a total waste of time to distribute something dull and unattractive. Calendars that fail to grab attention will probably end up at the bottom of a trash bin and won’t yield long-term results. To remind customers about your business every day of the year, you will need to put some time and effort into creating a calendar people would want to keep and use. If designed smartly, a calendar can become an additional stream of revenue for photographers, graphic designers, illustrators, or even help a charitable organization raise funds. You are none of those businesses? Well, there are still plenty of reasons to use calendars in your marketing efforts. This affordable marketing tool will have a long-lasting impact on your prospects as calendars tend to stay on people’s desks 365 days a year. Send out a bunch of desk calendars to business partners, suppliers, customers, and prospects at the end of November and get ready for harvesting results. 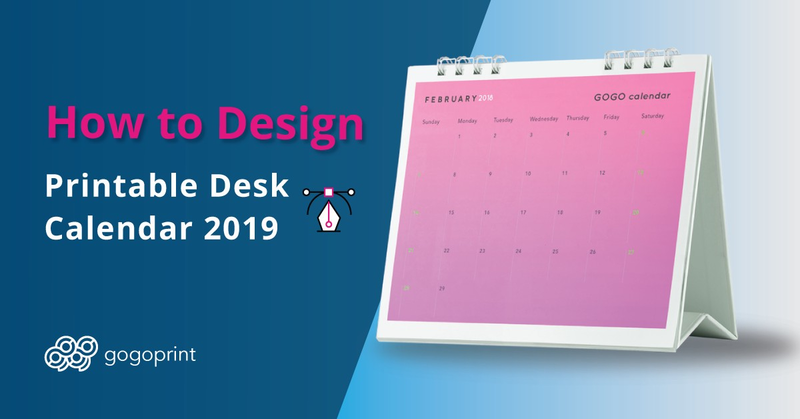 To make an outstanding desk calendar for 2019 you will need Adobe Illustrator, a couple of hours of free time, and a pinch of creativity. Without further ado, let’s jump into exploring this marketing trick. First thing first, download a template of the format you want to go for. You can use our template to avoid making formatting mistakes. Quite often people forget to leave space for binding and end up with weirdly looking calendars. You don’t want that. In case you wish to create your design from scratch, check out our artwork preparation guidelines. They will give you all the necessary knowledge to create a perfect desk calendar. Customize the calendar table to match the design you have in mind. Stick to your business color palette to be recognizable, play around with different fonts and highlight the dates important to your business. Do you have a brand style guideline? Use it! If not, try to stick to not more than 5 colors and 2 fonts to keep your design consistent and easy. The minimalistic design of Right Choice Group’s calendar has only 4 colors yet it looks professional and clean. Perfect for B2B companies. Include unique elements such as logos, company's slogans, pictures of employees, events or corporate venues. A calendar is a powerful branding tool you want to use to the maximum, but do not go overboard. No one likes promotional materials full of ads. You can add vector images and shapes to make your calendar stand out. Basic Adobe Illustrator skills will be more than enough to do this kind of job. If you have a graphic designer in your team, you can step up your game like the University of Warsaw did for their 2018 calendar. An artist illustrated the university’s facilities and the city’s attractions. And it looks absolutely stunning! Spice things up with useful information. Turn the calendar’s white space into helpful industry-related tips and reminders of important events, holidays, or seasonal deals. If you are an accounting firm, you may include deadlines for submitting documents and tax returns. You can also include funny or interesting facts to make prospects look forward to flipping your calendar pages. Think what your audience might like and choose one theme that is most relevant to your business. The Wavelength Marketing’s Calendar from 2015 shared 12 top branding tips that were illustrated by Claudio Naccari. The useful, creative and nicely-designed calendar that you can use as an example for your future project. Now it is time to configure the file. If you haven’t checked our artwork preparation guide, it is time to do so. It is important to avoid making mistakes at this stage. Don’t forget to choose CMYK color mode while saving your artwork, otherwise, you might get the colors different from what you see on the screen. Look for hints in our artwork preparation section. Before you send your artwork for printing think of what paper and lamination you could use for the calendar. While it might seem trivial and irrelevant, this final touch can become a game changer. If you are not sure which option is the best just give a call to our customer support service and they will happily help you finalize the artwork. Following these easy steps, you will be able to design an impeccable calendar ready for printing. Simply submit your file to our online platform and Gogoprint will take care of the rest. In just a couple of days, you will have high-quality desk calendars you can start sending out to prospects. Don’t worry if your creativity got a bit rusty; we are always here to help. To get the ball rolling, check out our artwork preparation guidelines and monitor the blog to get the freshest print ideas. These materials will definitely help you come up with interesting desk calendar ideas. If you still have questions, do not hesitate to send a message or give us a call. We will be more than happy to tweak your artwork to perfection.